Sever’s disease also called calcaneal apophysitis, is a condition caused due to inflammation of the growth plate in the calcaneus (heel bone). Growing children and adolescents involved in extensive physical activities such as jumping or running and those who wear very flat shoes are at an increased risk of this disease. 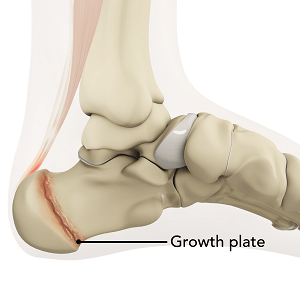 Patients may experience pain, inflammation and discomfort in the heel region. Sever’s disease can be treated with nonsteroidal anti-inflammatory medications, adequate rest, wearing proper footwear with pad support and strength-building exercises. Sever’s disease does not recur once a child has grown fully and the growth plate in the heel has matured into a solid bone.